Learn how Cambridge Semantics was able to establish a key milestone for loading and querying big data in 1.98 hours versus the previous record of 220 hours. 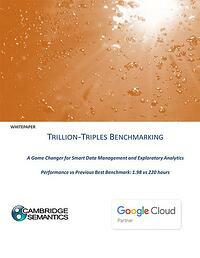 Recently Cambridge Semantics' AnzoGraph™ completed a load and query of one trillion (1012) triples running the Lehigh University Benchmark on the Google Cloud Platform in just under two hours, 100 times faster than any previous solution at the same data scale. This performance improvement of two orders of magnitude signals a paradigm shift of graph Online Analytical Processing (OLAP) rapidly moving beyond the niche domain of “graph problem” to that of everyday "business as usual"-style analytics, offering a radically more efficient and rich approach to OLAP. End users of the AnzoGraph can now enjoy rapidly automated database provisioning, followed by exceptionally fast data loading and the high performance of sophisticated insights by generating analytics on vast diverse multidimensional data sets at an affordable cost. Fill out the form to the right to download this whitepaper and learn all the details behind this revolutionary benchmark result.